9 Benefits Of Walking On Your Health #Infographic ~ Visualistan '+g+"
Walking it's a physical activity that fits easily into your agenda of the day. But, what are the real benefits of walking and how is it possible to benefits from it even at work? 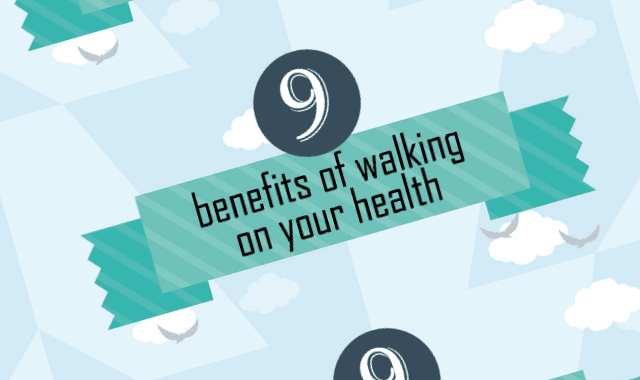 Discover 9 health benefits of walking. 1. Stimulates creatives thinking: Walking helps to generate new ideas and increase creativity for an average of 60%. 2.Reduces stress: Walking solicits the cardio-respiratory system and provides better oxygenation of the tissues and release of endorphins, hence the soothing effect. Walking is therefore an excellent natural stress releaser. 3.Helps to sleep: Walking is a good remedy to get the necessary rest and finally to regulate its sleep. 4. Makes us happier and cheerful:Doing physical activity stimulates serotonin, commonly called the happiness hormone. 5. Helps to lose weight: your walking sessions should exceed 30 minutes to be beneficial to your body. 6. Control cravings: Going for a walk can help greatly to change ideas and forget the small hollow that tangles our stomach. 7. Gives energy: Walking regularly enhances the oxygenation of the muscles, organs and brain, in addition to activating the central nervous system. 8. Can extend life expectancy: walking stimulates anti-aging process and helps repair cells. 9. Reduces diseases and injuries risks.